Important information regarding Triad alcohol prep pad recall. 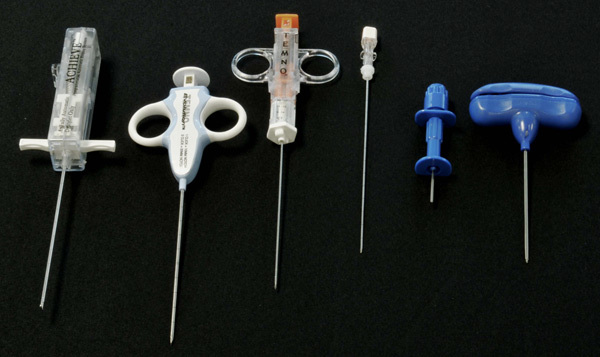 CareFusion offers a wide range of soft tissue biopsy needles that you can rely on for precise samples every time. Our proven brands offer a complete selection with advanced features to obtain top-quality tissue samples quickly and efficiently. All of our devices are available in a wide range of gauge sizes and lengths to meet the technical requirements of most procedures. The lightweight, automated Achieve biopsy system offers spring-loaded action for fast, accurate penetration while giving you the precise control and quality sampling capability you need. Temno Evolution® NeedleTemno Evolution biopsy system offers many of the same features that made our original Temno® biopsy needle a leading seller, while setting the standard for procedural flexibility and performance. Adjustable Coaxial Temno® (ACT) NeedleThe Adjustable Coaxial Temno (ACT) biopsy device lets you manipulate the sample notch size from 9 mm to 19 mm for precise control with small lesions and peace of mind in vascular areas. Temno Evolution biopsy system offers many of the same features that made our original Temno® biopsy needle a leading seller, while setting the standard for procedural flexibility and performance. The Adjustable Coaxial Temno (ACT) biopsy device lets you manipulate the sample notch size from 9 mm to 19 mm for precise control with small lesions and peace of mind in vascular areas. The streamlined, ergonomic design and super-sharp tip of the T-handle Jamshidi bone marrow biopsy/aspiration needle make it a top choice for comfort and superior cortical penetration. The original Jamshidi needle offers features that have made this bone marrow biopsy/aspiration needle a best-seller for decades. The Illinois needle offers a sharp lancet point that penetrates easily into the bone to help ensure a safe and simple aspiration of marrow from the iliac crest or sternum.